She also appeared in the Chicago stock company production of Carmen Jones, and performed in a New York production of Porgy and Bess. On the West Coast, she appeared in The Roar of the Greasepaint – The Smell of the Crowd. Between acting and singing engagements, she did occasional modeling work. In January 1967, Nichols also was featured on the cover of Ebony magazine. 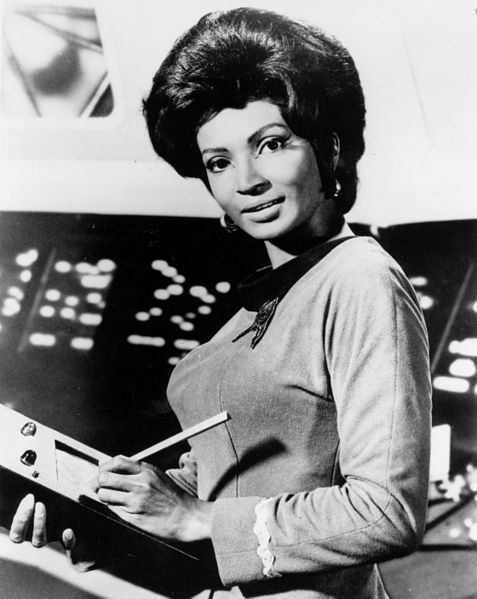 After the cancellation of Star Trek, Nichols volunteered her time in a special project with NASA to recruit minority and female personnel for the space agency. The program was a success. Among those recruited were Dr. Sally Ride, the first American female astronaut, as well as Dr. Judith Resnik and Dr. Ronald McNair, who both flew successful missions during the Space Shuttle program before their deaths in the Space Shuttle Challenger disaster on January 28, 1986. Recruits also included Charles Bolden, the current NASA administrator. An enthusiastic advocate of space exploration, Nichols has served since the mid-1980s on the Board of Governors of the National Space Society, a nonprofit, educational organization founded by Dr. Wernher von Braun. Best wishes to Nichelle Nichols, and a speedy recovery. This entry was posted on Thursday, June 4th, 2015 at 12:07 am	and is filed under Blog by Manny Pacheco. You can follow any comments to this post through the RSS 2.0 feed. Responses are currently closed, but you can trackback from your own site.